Su verdadero nombre es "Puente de San Juan de Ortega", en recuerdo de una capilla que en el siglo XVIII existía en la orilla izquierda del Ebro en honor a este santo al que algunos historiadores consideraban el constructor del primer puente de piedra que existió sobre el Ebro a su paso por Logroño. El que ha permanecido hasta nuestros días fue proyectado por Fermín Manso de Zúñiga e inaugurado en 1884. Tiene 198 metros de longitud y cuenta con siete arcos sustentados sobre pilares cilíndricos. The Church of San Bartolomé is the oldest in Logroño. Built of ashlar stone, its elevation corresponds to the 12th century, conserving the central semicircular apse and the decoration on the capitals typical of the churches along St James' Way. To be especially highlighted is the carefully carved ogival Gothic doorway. Its Tower was part of the city's defensive system, part of the walls that were extended as the town centre grew. Thus, the first two sections of the tower are of ashlar like the Church and the wall, and the next two are of stone decorated with small Mozarabic tiles. 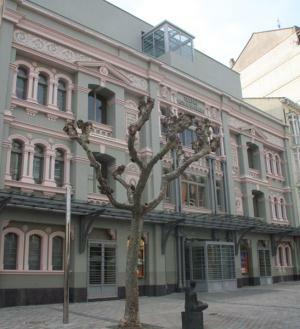 Teatro Bretón de los Herreros, popularly known as Teatro Bretón, is a municipal theatre exhibition space (belonging to Logroño City Council). To see its programme, visit the page that appears below. The Church of Santiago el Real is one of the pilgrims' stops. Dated in the 16th century, it is the church most related to the city, where the City Council would meet and the archives were kept. 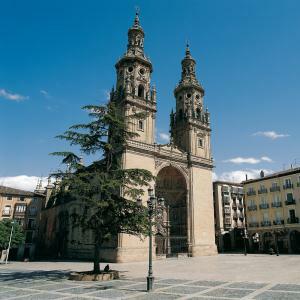 The façade, designed as a triumphal arch (17th century), is decorated with two statues of Saint James (Santiago), one wearing the pilgrim's habit and another Santiago "Matamoros" (St James the Moor-slayer). Next to the Church is the Fuente de Santiago, also known as the "pilgrims' fountain" since here they would stop to rest and cool down. The Imperial Church of Santa María de Palacio, located in the heart of the old town, was founded in the 11th century, extended and renovated in the 16th, and rebuilt in the 18th. Divided into three naves, annexed are the cloister and the Chapel of Nuestra Señora de la Antigua. Over the central nave is a lantern popularly known as "la Aguja", (The Needle), the main altarpiece, by Arnao of Brussels, mid 16th century, and the statues of the Virgen del Ebro, Romanesque 12th century, and Virgen de la Antigua. Today its cloister is a part of the Diocesan Museum. Rarely do markets play such an important role in the history, tourism and life of the city like the Mercado de San Blas. Its walls have heard many stories and hide the heartbeat of the city; a world full of smells, sounds, textures, colours and shapes, where not only goods and products, but also gossip, advice, and greetings are exchanged. 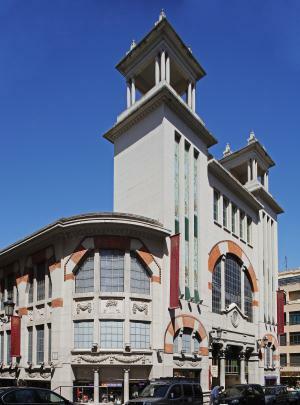 Logroño's Mercado de San Blas combines architectural beauty a tasty culinary offer. Fish, vegetables, nuts, spices and cold meats are some of the products that distinguish the stalls in this market providing it with its own personality that changes tastes every season. Tradition and professionalism are the mark of our merchants, which makes them specialists in all types of produce and foodstuffs offered in the market. Who better to give advice?. We want you to feel safe at our side. The Church-Cathedral of Santa María de la Redonda is located on one of the city's main streets, Calle Portales, built on the site of a 12th-century oratory. Work began in the 15th century, being extended and reformed until the 18th. The main facade is sculpted like an altarpiece and closed by a large wrought-iron fence. 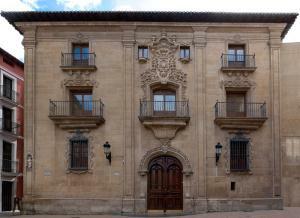 The towers, known as "las gemelas", (The Twins), an example of the Baroque style in La Rioja, are related with others in La Rioja due to their designer, Martín de Beratúa. divided into three naves separated by large cylindrical columns and ambulatory. The most representative elements are: a picture of the Crucifixion of Christ, attributed to Michelangelo; the tomb of General Espartero and his wife, Dña. Jacinta Martínez de Sicilia; the exceptional wrought iron railings closing the side chapels; and the Santo Sepulcro (Holy Sepulchre) in the Chapel of Nuestra Señora de los Ángeles, with splendid details in tortoiseshell, filigree silver and wood. - Ice rink with seating for 640 persons. - Sports Centre, with seating for a thousand spectators. - Urban spa with hydromassage pool, relaxation, baths, steam baths, steam saunas, cyclonic showers, tonification, ice fountain, etc. - Changing rooms, toilets storerooms and cafeteria. 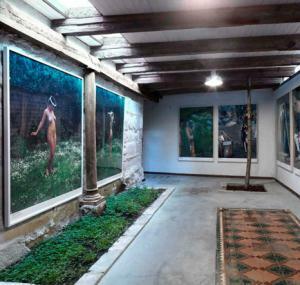 La Casa de la Imagen (The House of the Image) is in an old building (1700) that has been renovated respecting the architectural typology of the historic building, under the parameters of sustainable, ecological and bioclimatic architecture. 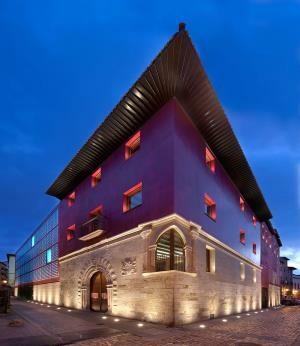 All the floors of the building are entirely devoted to photography and video, in the historic centre of Logroño. La Casa de La Imagen is a contemporary arts centre, with an art gallery, a publisher's, an audiovisual training centre, an archive with important collections of historical and contemporary photography, meeting rooms, classrooms, sets, laboratories, a recording studio, an extensive library and a specialised shop. Alfaro: Graccurris: this was the first Roman settlement in the Ebro river valley. Calahorra: Calagurris and Iula Nassica: since the time of the Pax of Augustus, this became a town in its own right, with public works such as aqueducts, sewers, spas and a circus. Varea: Vareia. This was one of the most important Roman towns, where numerous remains such as coins, pottery and the gold and silver broach of Varea have been found. Tricio: Tritium Magallum: this was a pottery centre which distributed “terra sigillata” (stamped earth) containers throughout the Roman Empire. Libia: a settlement whose foundations are located between Herramélluri and Grañón. The most important road is the Ebro Valley road, from Saragossa to Briviesca. Secondary roads come off this main Ebro road, communicating Numancia through the valleys of the rivers Irregula, Najerilla, Leza, Cidacos and Alhama. A 35 km section of the Roman Road from Varea to Numancia, between Torrecilla at Cameros and Piqueras, has been recovered and conditioned for walking. The Mantible bridge over the river Ebro, some seven kilometres from Logroño, towards Asa. The Cihuri bridge: a Roman bridge from the 2nd century AD, reconstructed in the medieval period, over the River Tirón in the district of Priorato. At Calahorra, of the town’s four main gateways, the gateway of the Planillo de San Andrés still remains, together with another next to the vestiges of the ramparts under San Francisco, and a further gateway is concealed in the street of Refugio. Of the five or six towers that were constructed in the high part of Calahorra, only one deteriorated tower, named Morrión de San Andrés, is still conserved at the Portillo de Lan Rosa. In Calahorra there was a Roman circus around the present-day Paseo del Mercandal walk, of which only the vestiges of the northern walls remain. Also to be found in Calahorra are the vestiges of a temple, spas, sewers, drainage system, all of which can be visited. At Alcanadre, the vestiges of an aqueduct can be found. 13 arches of the original 108 arches still remain; it is located between the Ebro river and the road from Lodosa to Los Arcos and was designed to carry water to Calahorra, 18 kilometres in a straight line. The Sorbán Aqueduct, which possibly brought water from the area of Arnedo. In Alfaro, 1st Century. Roman Nymph Fountain. A National Monument. A hydraulic complex comprising a dam, bridge and fountain, a place to worship the nymphs of Alhama until the 4th century. Dama Calagurritana. (Lady of Calahorra). A removable head, 21 cms high, found in the archaeological site of La Clínica in Calahorra, dates back to the 2nd century. Venus of Herramélluri: a bronze sculpture, small in size (20 cms high), 2nd century. Aphrodite of Calahorra. A white marble sculpture, 1,20 metres high, 1st century. At the potteries of Tricio, Bezares, Arenzana de Arriba and Nájera red ceramic pots were made, characterised by the fact that they bore a seal with the name of the potter on the base of the article, and for this reason they were called “terra sigillata” (stamped earth). At the pottery archaeological site of La Maja, which is currently being dug, the vestiges of glass manufacture have appeared.